This is said between Maccy and Orga. Maccy has already reached that stage of mentality where he will use people as an ends and nothing more. Orga on the other hand either has yet to reach such a point or he thinks his intentions of good will work out in the end. The dichotomy is welcome at this early part of the show, in the absence of an overarching plot. They’ve got goals they’ve got to complete, and they’ll do anything it takes to get them where they need to be. The question then is raised what happens when Maccy finds them a nuisance and disposes them to prevent further troubles. Intrigue abounds. We also finally get to a bit more of Mika when he reunited with Kudelia and… There’s really not much to them anymore. Where there was a palpable disconnect between them as per their classes, they now see each other as equals. Mika remains very stoic, but genteel in his own Mika way to her, and she still looks at him with fondness. Atra is still a sweetheart though, and deepens their connection (hopefully doesn’t involve her death in the future fingers crossed) by giving her a bracelet like she and Mika have. It is truly a sweet moment, and shows how far all have come in being closer together. Now all we need to see is how they handle duress when the big arc comes along and changes things up. Speaking of arcs, there are some nice ones with the Earth-based Tekkadan and one of the new guys, Hush. Like last week’s episode, it shows the rather frayed edges of being in the business, and also how a mercenary group comes to blows with actual military men. 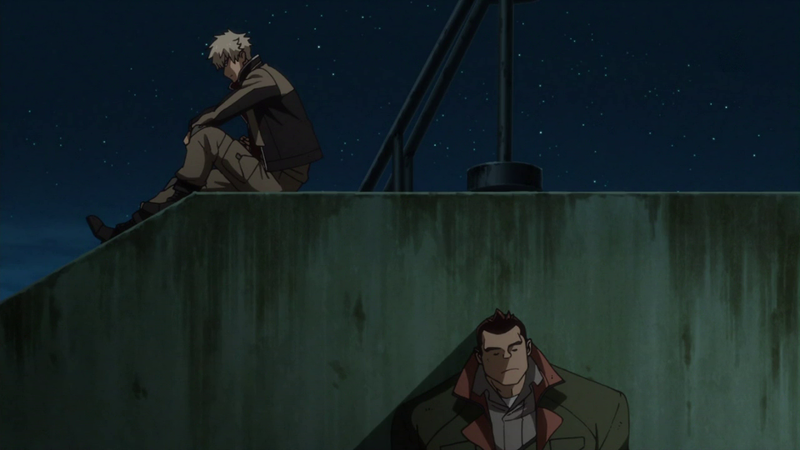 Takaki, who like the late Biscuit has a little sister who he pays school with, has a nice scene with a new Tekkadan member, showcasing how even on Earth they’re all trying to best to keep the spirit of camaraderie together. Hush gets the interesting arc out of all the characters though. After observing Mika’s sortie in the Barbatos Lupus, Hush asks around hoping to see if they’d let him have the Alaya-Vijyana System surgery. Obviously, he’s denied this but then it leads to something we NEVER saw in the first season: the effects if the surgery had failed. What’re those effects? Paralysis from the waist down. It is a fate so unwelcome that the older brother figure Hush had back in the slums committed suicide after being dumped back where he came from when the surgery failed. Rather tragic, really. Had he been hired by Tekkadan only a few years or so later then he would never have been abandoned, but since it was the former CGS who did that well… Yeah. This moment makes Hush by and large the most interesting character in the show. Whereas Maccy, Orga, and even Kudelia have their passions tempered by dealing with the machinations of life, and Mika is Mika, Hush is full of wondrous passion and genuine motivation towards something. It may make for an eventual betrayal where he ends up with Gjallarhorn and becomes another Ein, or he may become a tragic figure to show what Tekkadan hath wrought in perpetuating this industry. Either way, I’ve got my eyes on that boy. And I’ve got my eyes on next week since we have a space battle in it. After a good hour familiarizing ourselves once again with the people we left a few months ago, I guess it’s time to move forward into new and exciting things. Good, since it’s hard to get excited over retreading old ground right now. I should probably give my opinion on new Season 1 dub that is currently airing on Toonami right now: it’s good. I really like it. It works very well and I’m glad to see such quality in it. Props to erryboddy. While “OOOOOOOORPHAAAAAAAAAANS NAMIDA!” is a memorable song to be sure, I’ve got to say the new ED may probably be my favourite. So many great shots and good use of our young heroes doing dangerous kiddie things only orphans would do. OP’s good too. Song’s nice, but LOVE the visual flair of it. Nice aesthetic touch too. Notice when Orga and Maccy are talking, the device used to converse is always shown at its back. I found that curious since it raises the question if they can see one another. Then in the next scene, when Orga informs McMurdo of it, it is revealed it is “VOICE ONLY”. I guess that answers the question. Cheeky.